Customize Plugins and Child Themes Easily. Now you can use the top-rated Child Theme Configurator interface to customize WordPress plugins—WooCommerce, Contact Form 7, BBPress, and any other plugin that has a stylesheet. All new design makes it much easier to get the results you want. Compare FeaturesIf you spend any amount of time editing CSS or customizing WordPress themes, Child Theme Configurator PRO will help maximize your productivity and can save hours of development time. Designed by developers who use it every day. We’ve added more features to make design work quicker and easier with Child Theme Configurator PRO. If you are using even one plugin, it often never quite matches your website. Plugin authors make an effort to keep their plugins generic so that they don’t interfere with the Theme, but even with vast knowledge and expertise in CSS, the process of identifying existing styles and determining the correct overrides to get the results you want can takes hours of development time. Child Theme Configurator PRO makes it easy to make your plugins match your Theme exactly. You can customize any WordPress plugin, even if it uses multiple stylesheets. 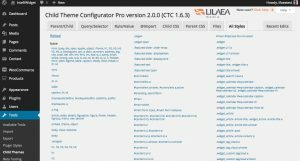 Child Theme Configurator PRO lets you choose from your installed plugins and save the results in your Child Theme directory. Use the “All Styles” panel to edit groups of selectors from a single combined list. Tweak menus quickly and easily.Isolate specific groups of styles using the search tool. Return to recently edited selectors from a toggleable sidebar. Test your child theme with a single click. Use your browser to inspect elements and find CSS selectors from within Child Theme Configurator. No more bouncing around WordPress to preview your site. Keep the colors you select just a click away. No more searching for hex codes and RGB values. Automatically detects and configures Genesis Child Themes with more frameworks on the way. Your license includes an Update Key that gives you access to new PRO features as soon as they are released. To configure WordPress to automatically alert you of available updates, enter your Update Key in the box under the “Files” tab. Download and install the latest version of Child Theme Configurator. 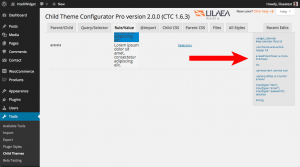 Purchase and download Child Theme Configurator PRO. In the WordPress Admin, go to Plugins > Add New. 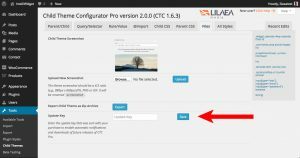 Activate both plugins through the “Plugins” menu in WordPress. *Based on the position in WordPress.org “most popular” plugin search.